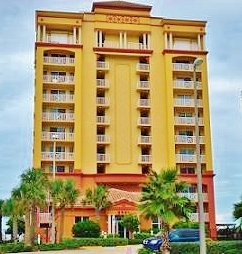 Tuscany Shores Condominium is a rare oceanfront luxury condo with Mediterranean style located in Daytona Beach Shores FL. This beautiful complex features all 3 bedroom and 3 bath units with ocean and river views. All 33 condo units are direct oceanfront and span the length of the building. Enjoy the views through the wall of windows that overlook your private tiled terrace. Imported Italian porcelain tile is located throughout the living area. The gourmet kitchen has granite counter tops, high end appliance packages and breakfast bars. This 11 story, 33 unit complex offers an exclusive lifestyle and luxury living. The rental policy is a 1 month minimum and the association allows up to 3 pets with no size limitation.